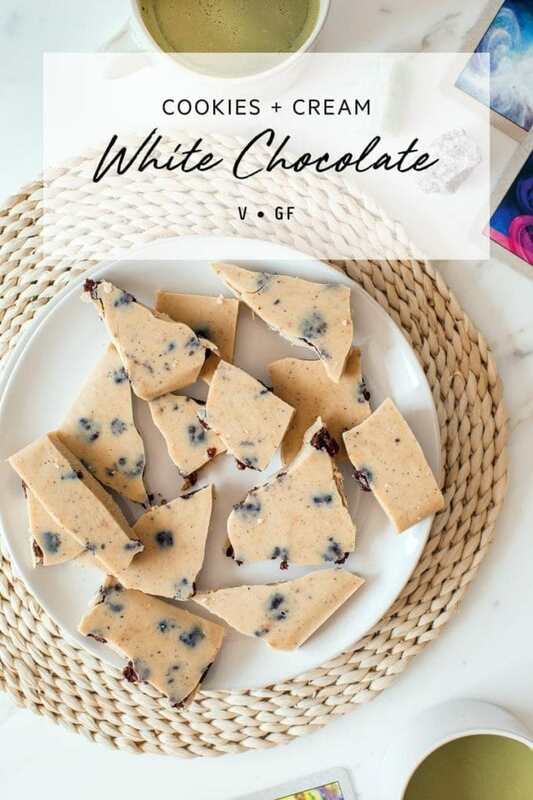 Cookies and Cream White Chocolate bark – my answer to the Hershey’s choc bar I used to love so much as a kid. Pure cacao and macadamia nut butters combine for the ‘cream’, whilst a simple raw brownie mixture makes for a fab ‘cookie’. Made without refined sugars – naturally sweetened with whole dates instead. This recipe is actually in response to a reader’s request – and I’m so grateful for the challenge because this has turned out just beautifully. 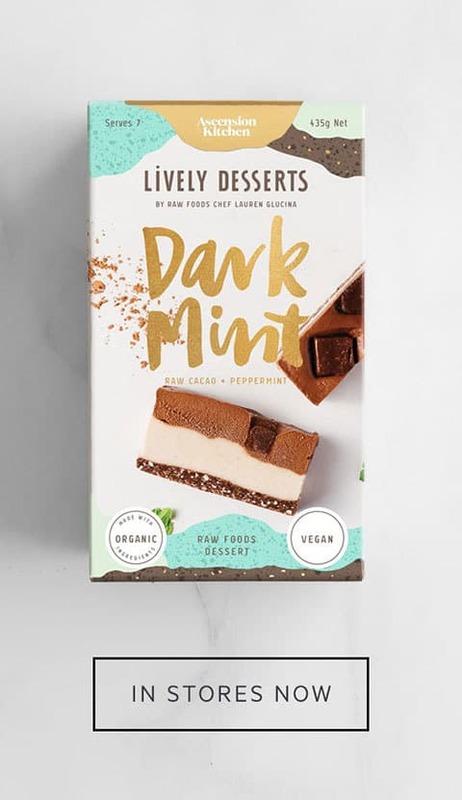 I grew up with quite the addiction to chocolate, and whilst I mourned the loss of my favourite sweet treat as I transitioned to a plant-based diet, it wasn’t for long – as I quickly discovered that you can in fact make some exquisitely delicious creations out of far more wholesome (and ethical) ingredients. This cookies and cream bark is a case in point. First of all, we have a very simple alternative to the ‘cookies’. 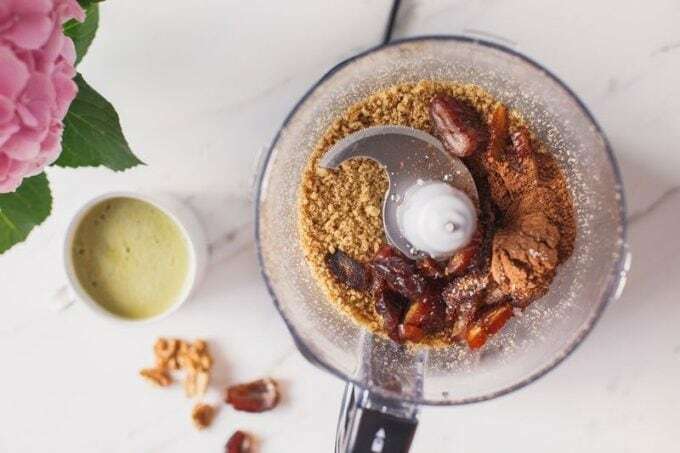 Walnuts are ground to a meal in a food processor, then whole Medjool dates are added, with a little raw cacao powder, sea salt and vanilla. After a minute or so you get a delicious raw cookie dough – just roll into little balls and scatter over a baking tin, ready for the white chocolate mixture. To make the ‘cream’ portion of our white chocolate bark, we need four simple ingredients. Firstly, cacao butter is what lends that lovely white chocolate taste. It is simply the pure fat pressed out from the raw cacao bean. It has a wonderfully silky, creamy texture. I find it far easier to handle when you purchase it in small buttons, as the chunks require quite a bit of time (and heat) to melt. Cacao butter, whilst undeniably tasting pretty yummy, tends to feel a little waxy in the mouth. To counteract this, I’ve paired it with a generous amount of macadamia nut butter. Macadamia nuts seemed a natural fit in this instance, as they are soft and mildly sweet, and nearly white in colour. It helps to mellow out that yellow tone that cacao butter has, and so gives a nice authentic end result. You can either make your own macadamia nut butter at home – or use a store-bought brand for convenience. When I’m not lazy, I buy nuts from the bulk bin store, and keep them in the fridge or freezer till I’m ready to use them (this keeps them fresh). 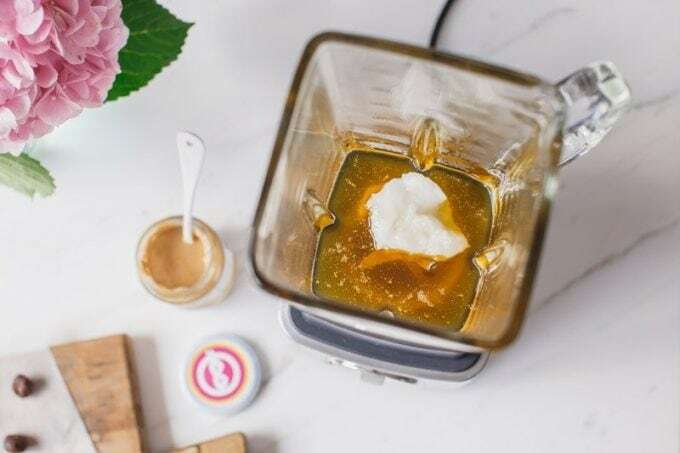 To make them into a nut butter, just add a few heaped cups to a food processor or high powered blender, and whiz till creamy. If you’re doing this in a food processor, you may want to stop periodically to both scrape the sides down and avoid it overheating. The blender I find is a much quicker method. When I am feeling lazy (often), a store-bought nut butter also works a treat. My absolute favourite is the Salted Macadamia from Forty Thieves. Forty Thieves are a local brand from the Hibiscus Coast, a little north of Auckland. 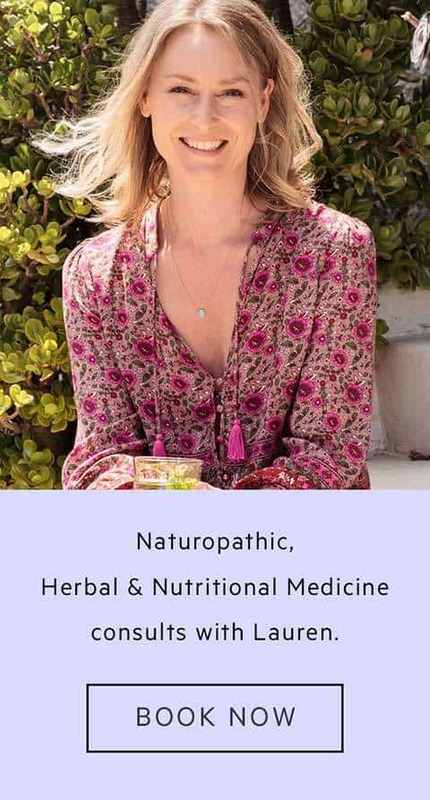 Run by the dynamic duo Shyr and Brent – their brand name was inspired by the Ali Baba and the Forty Thieves tale – because each jar of nut butter is packed with hidden nutritional gems. Love it! I reckon they make the best nut butters in all the land. 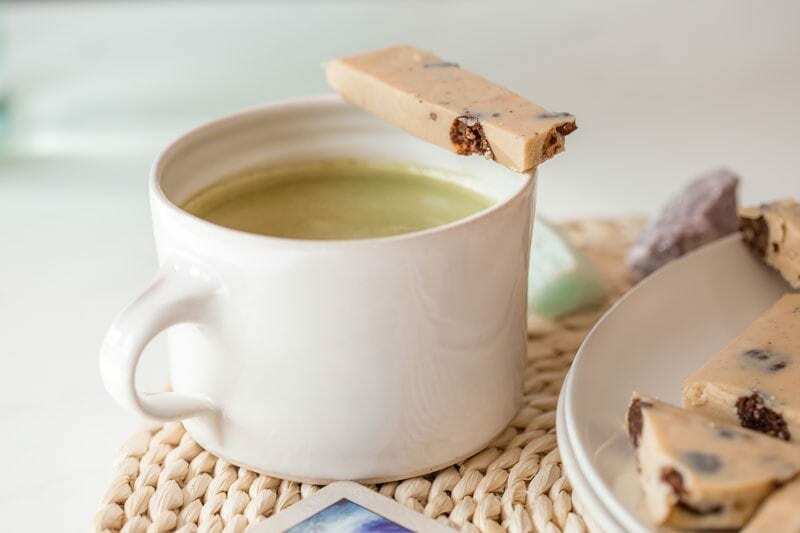 They have all your classics (almond, cashew, peanut, tahini) as well as some delicious and creative combo’s – the Salted Macadamia is my favourite, as it also contains a bit of cashew butter, pure maple syrup, and vanilla bean – luxury! 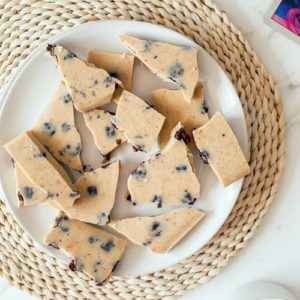 Ok, so we’ve covered two of main ingredients in our health-ified cookies and cream white chocolate bark – next up is a little coconut oil. It adds a lovely flavour and gives it a nice melt-in-the-mouth feel. To sweeten it up – we have some liquid stevia. I find the liquid drops don’t have the same bitterness as the powdered stevia does, and you only need to work with tiny amounts as it brings a full-on, intense sweetness to the mix. There are many types of liquid stevia on the market – make sure you source one that is a clear liquid – some of them are actually dark brown in colour. The clearer the better when making white chocolate, obviously. 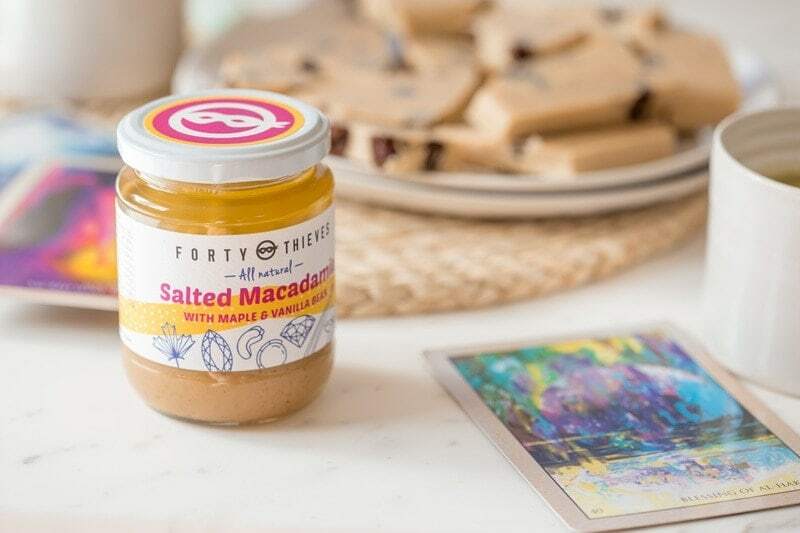 Note – if you opt for the lovely Forty Thieves Salted Macadamia, you may not need the stevia – they have a hint of maple in there which to me, is the perfect amount of sweet. Lastly, I’ve also used a pinch of coarse sea salt to round out the flavour, and a dash of double-strength vanilla extract to enhance the sweetness. They’re not essential to the recipe but certainly make it taste delicious. 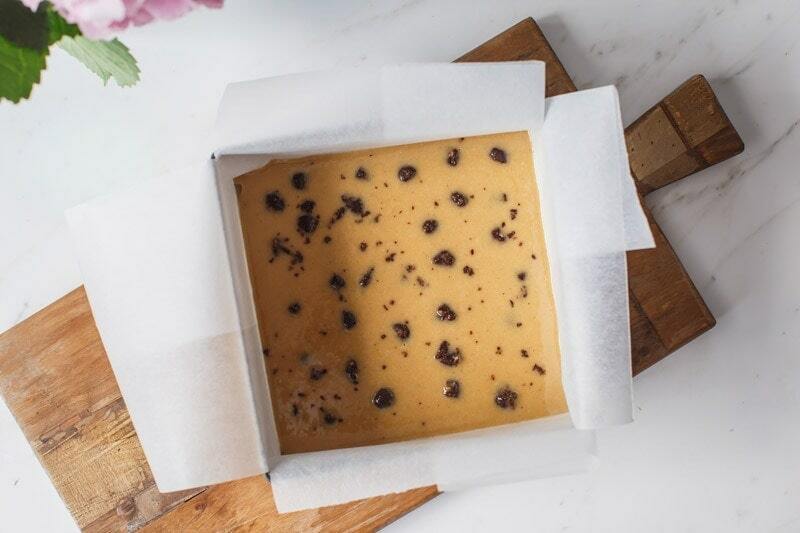 To make the white chocolate, you blend all of the above ingredients together, then pour into a lined cake tin – scatter over your ‘cookie’ dough and freeze to set. This recipe will fill an 8-inch baking tin, and you’ll get up to 32 portions (you only need a small amount – very rich). 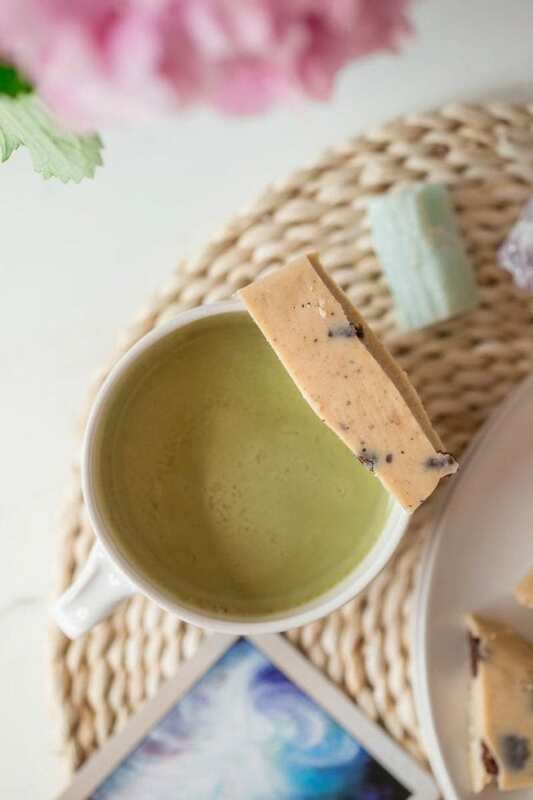 I photographed them here with a couple of mugs of matcha tea (teaspoon of matcha powder, hot water, teaspoon of coconut butter, and blend). The oracle cards (you all know I’m obsessed) are the Rumi deck by Alana Fairchild – a favourite of mine. And that my friends, is it! It’s a super simple recipe right? Who needs Hersey’s when you can cleverly combine whole foods into (nearly) the same thing? 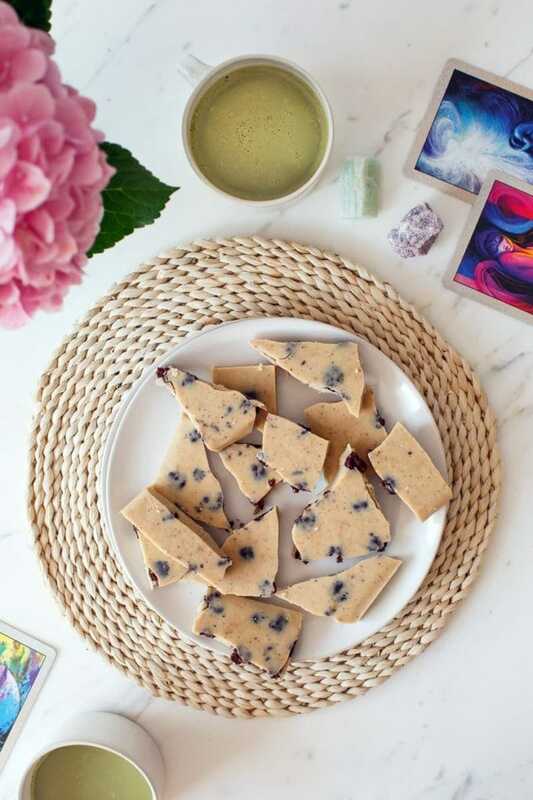 A delicious refined sugar free 'cookies and cream' white chocolate bark, made with raw and vegan ingredients. Fills an 8 inch square baking tin. Break into approx. 32 pieces to serve - a little goes a long way. 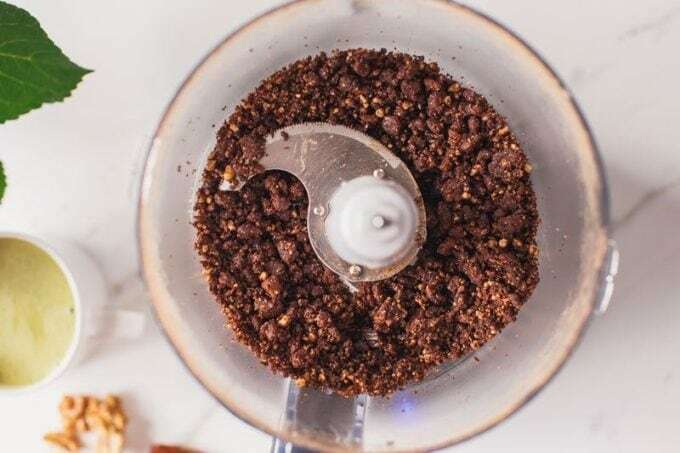 Pulse the walnuts in a food processor till nice and crumbly. Add everything else and keep blitzing till you get a nice dough. Line an 8 inch square baking tin with baking paper. Scatter the little balls in the tin. Blend everything in a high speed blender till smooth. Perhaps start with 10 drops of stevia and add more if you like it sweeter. Some brands are stronger than others. Pour over the cookie balls in the baking tin. Freeze for half an hour to set. Yes I did have a piece for breakfast. And what? 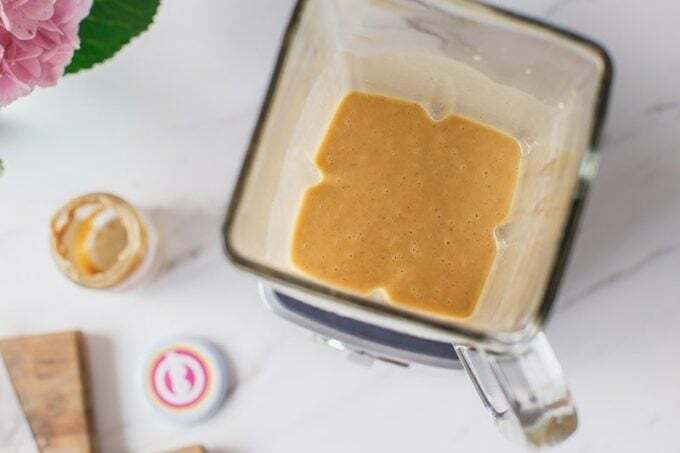 To make macadamia nut butter, add macadamia nuts to a food processor or high powered blender and blend in short bursts till creamy, stopping to scrape the sides down as needed. My preferred store-bought brand is the Salted Macadamia by Forty Thieves. 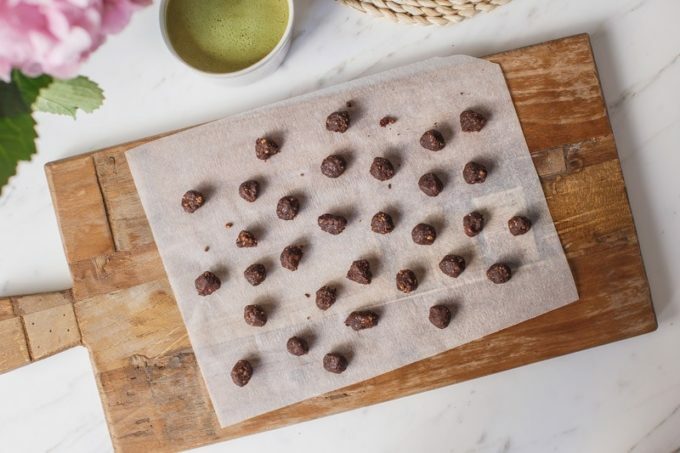 You probably won't need to use the entire cookie dough mixture - just roll excess into bliss balls to enjoy later. Make sure you use quality organic coconut oil - sometimes supermarket brands have been refined or deodarised and therefore don't taste all that nice - smell before using - you'll quickly spot if it's off, rancid, or just not coconutty enough. Best kept in the fridge or freezer - melts easily. 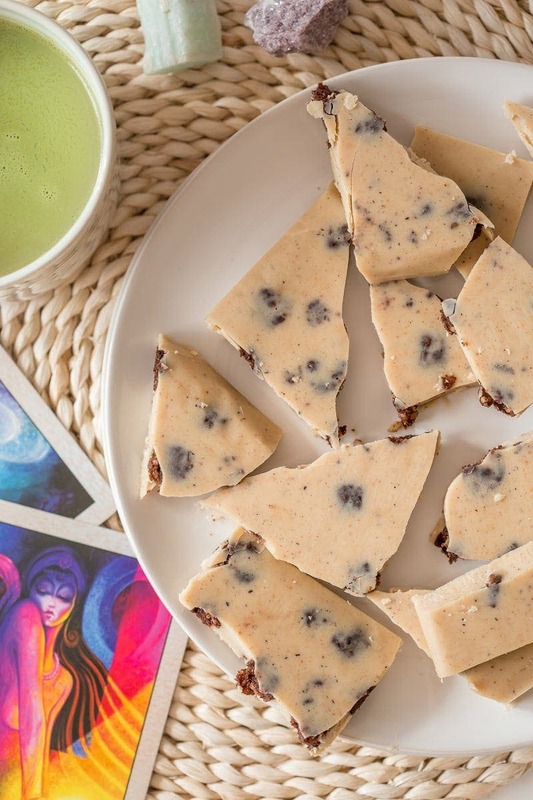 Expect this to taste soft, slightly waxy, and more fudge like than than a snappy chocolate or bark.